For many people and businesses challenging times and the daily grind make it hard to overcome negative thinking. And, unfortunately, amid tight budget constraints that restrict the ability for anyone to say yes to anything at all it seems that a ‘New Art of Saying No’ has been spawned. It has gone way beyond the ploy to never return calls or reply to emails. It is an art that first goes against the very premise on what good business is founded on: namely that, whichever way you cut it, business is really only ever about two things – and two things only – Building Relationships and Following-Through. Secondly the art runs contrary to the fundamental principle of good communication: making people feel valued. Quite simply it is treating people as if they do not exist. For example, I recently heard from a good client that had been approached and invited by a organisation to visit their company and share some ideas. This they delivered in a professional manner – visiting the company at their own cost. Upon being told that the ideas were of interest they followed up in the usual manner of building the relationship. However absolutely nothing was forthcoming over a period of two months despite emails, calls, and letters. It was as if there had been no meeting at all. Eventually with persistence he got through to a director who relunctantly admitted that there was no longer a budget to progress the ideas. It seems that as companies enforce restrictions through understandable constraints their members are encouraged to deny any constraints. Rather than be open and admit that in tough times they cannot proceed and that the timing is bad they act as if the person offering them a service does not exist and cease all dialogue. In challenging times we need to communicate fairly with fellow professionals. Most people complain about the level of service that exists today – but we cannot complain about the street if we do not attend to our own house. The most important element in building a successful business, sustaining a good brand and holding a professional relationship is valuing those people we do business with – whether customers, suppliers or colleagues. People never forget rudeness. 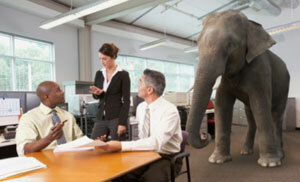 When you next meet it is like a big elephant in the room. The fact is that thoughtfulness always pays greater dividends than un-thoughtfulness. This is the real Art of Communicating. Do you treat the person in front of your desk in the same manner as you like to be treated sitting behind the desk?